The Luxbanx Speed Ring for Elinchrom, Impact EX from Impact features indexed flex rods that allow you effortlessly mount any square, rectangular, strip or octagonal Luxbanx softbox to Elinchrome and Impact EX flash heads. The ring will also fit most other brands of softbox. 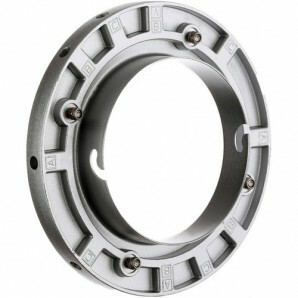 The sturdy all-metal ring rotates 360 degrees to facilitate orientation or to clear obstacles in tight quarters. It has 3/8""-16 taps on two sides to allow mounting directly to grip gear such as Inpact's Swivel Umbrella Adapter (IMCA108), 3 Section Double Articulated Arm (IMBHE119) or Super Clamp (IMCC106R). Please see specs for full flash head compatibility list.